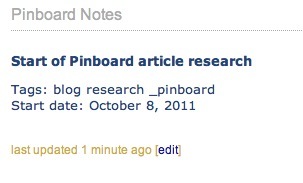 I joined Pinboard.in back in April 2010. I can’t remember the price back then, but it was cheap. Pinboard pricing increases with the number of registered users. The sooner you join, the cheaper a lifetime membership is. That’s right, lifetime. As of this post, a lifetime membership will cost a mere $9.48. Add as many bookmarks as you need. Visit as often as you like. Never pay again. In many respects, Pinboard is similar to the way Delicious bookmarks was several years ago. The interface is sparse but the site is fast. That’s no coincidence. From the beginning, Pinboard tried to be what Delicious had failed to be. A bookmarking servie to store bookmarks. In fact, Pinboard made sure their API matched the Delicious API so closely that any application or script could transition from Delicious to Pinboard with almost no modifications other than the end-point URL and authentication credentials. As Pinboard has grown, the number of applications that can be integrated with it has grown. Partly because the API mimics the traditional Delicious API. But it’s also because Pinboard can provide any public group of tags as an RSS feed. This makes it easy to read the links from any RSS reader without having to login to Pinboard. Simple integration options have provided a wealth of opportunites for using Pinboard from other apps. My most commonly used integration is with Reeder for Mac and iOS. I also have a Pinboard service installed in Google Reader. Access to Pinboard doesn’t stop there. 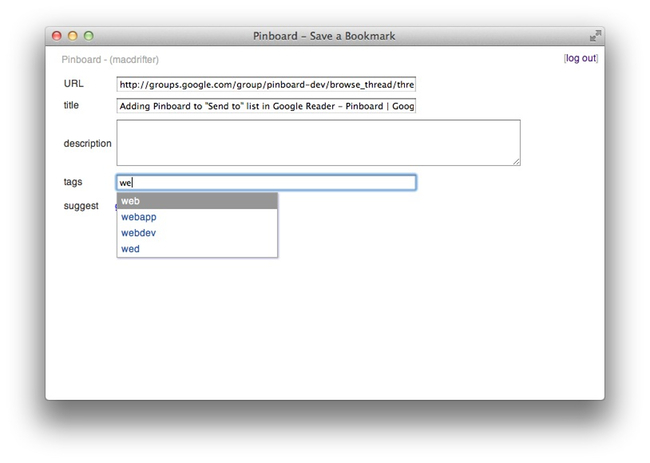 There are many more ways to add and read bookmarks from Pinboard.in. I’ve highlighted what is, perhaps, the best bookmark app on the iPad, DBD. It’s a bad name but a great app. 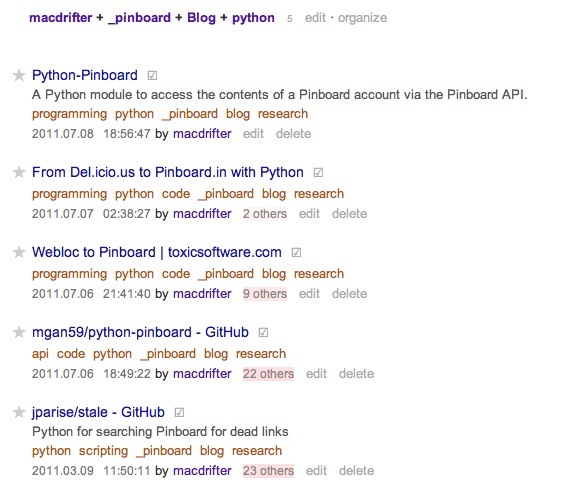 Pinboard was designed from the ground up as private bookmarking system. Bookmarks and tags can be set as private to prevent anyone else on the service from seeing them. The service provides a default setting that I leave set to private. I use the service for bookmarking my personal research as well as research for my job. By setting my bookmarks as private, there’s less of a risk I might accidently expose some bit of research I would rather keep under wraps. The bookmarklet provides an on-the-fly toggle of the privacy settings. I can also go back and edit the settings at any time. 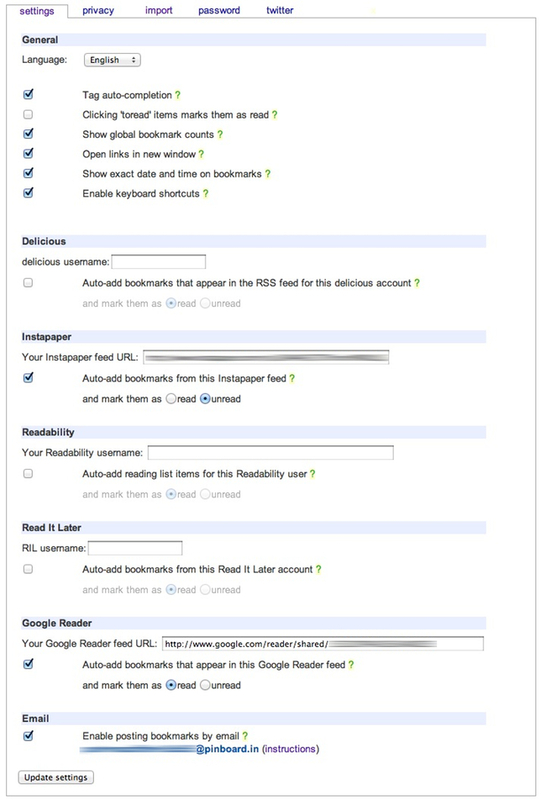 Install the bookmarklet in any browser to get instant access for adding links to an account. These aren’t dumb bookmarklets either. They display auto-complete for tags as well as options for marking a link as public or private. Each account comes with a secret email address to add bookmarks. Not just a URL, but notes and tags can be included with an email. The format is simple but effective. They have you covered. Delicious, Safari, Firefox, Google Bookmarks, Diigo, Trunk.ly, Historious. All of them can be imported in a few minutes with tags and privacy settings maintained. Pinboard also offers several ways to automatically add bookmarks from other services. There is direct support for pulling bookmarks in from Instapaper, Google Reader, Read It Later, Readability, and Delicious feeds. These are really handy for adding bookmarks to Pinboard when an app only supports Instapaper. I can freely add links to Instapaper and know they will end up in my Pinboard account as well. There is also support for Twitter scraping. There is a maximum limit of 3 Twitter accounts, but I only ever need my main account at @macdrifter. With the feature enabled, any link I add through Twitter is also added to my Pinboard collection. The bookmark even includes a reference to the original source (i.e. Twitter or Instapaper). Any bookmark can contain a detailed description. The description field is included as part of the global search, so if tags don’t quite cover the bookmark, I add some explanatory notes. But notes go further in Pinboard. Rather than adding a link as a bookmark, I can add just a note to my bookmark collection. Notes can also be public or private. This isn’t going to replace Simplenote or Evernote, but it can be handy. For example, if I have a big project that I am researching, it’s handy to have notes included with the bookmark stream. For example, when starting a research effort, I add a note to the timeline that indicates when I started and what tags will be used for the related links. Self documenting bookmarks. An additional $25 per year adds-on bookmark archiving. As long as your archival account is active, any link in your bookmarks will always be accessible. The Pinboard service takes a snapshot of the linked page and adds it to your archive. If the link becomes unreachable, then accessing the bookmark will display the archived version of the page. It’s kind of like your own personal Way Back Machine. What would a bookmarking service be without tags? Pinboard tagging is simple. They are one-word relationships that group bookmarks in a genealogy. I get a tag cloud and tag auto-suggestion when I add or edit bookmarks. Clicking on a tag filters all of my bookmarks that share that tag. Adding a period to the front of a tag makes the tag private as well. That means anyone that is part of your network can not see those as available bookmark tags. It’s more than a “private browsing” setting for surfing for naughty bits (of course I mean Perl code). Combined with the default privacy settings I can comfortably research projects for work without exposing too much information about my intent. The power of tags is in their combinations for searching. Tags can be easily combined by clicking the “+” symbol next to the tag in the tag cloud. Here are the python tagged linkes for this post. The one missing feature (or at least not documented) is the ability to perform other boolean combinations with tags. For example, finding all bookmarks tagged “_pinboard” but not “python” would be handying for narrowing down a large collection. The tag cloud has two views: Top tags and all tags. It can be pretty overwhelming to display all tags. Conveniently, the cloud display can be easily adjusted to display the top 2, 5, 10, 20 tags. Tags are listed in alphabetical order but the tag size and weight is adjusted based on the number of bookmarks sharing that tag. 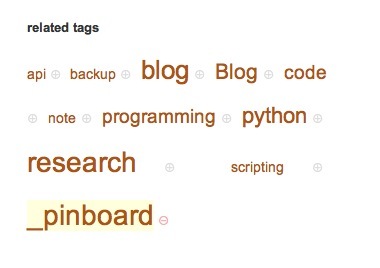 Pinboard is woirking hard to become an introverted social bookmarking service. While they are maintaining the terrific privacy settings, if I want to share bookmarks I can set them as public. This becomes useful if I want to crowd source specific tags. For example, if I want to subscribe to the public “omnifocus” tag I just click the subscribe link. The bookmarks do not automatically showup in my stream, but I get a “subs” link above my tag cloud to view any public bookmarks that share that tag. The searching facility is Pinboard is quite impressive. There are two search modes. One searches only your bookmarks. The other searches all bookmarks by all Pinboard users. Each search mode has the option to search only the bookmark properties like title, tag and notes. but also to search the actual bookmarked page content. That’s some pretty powerful secret sauce. Searching the page content is fast too. 1–2 seconds for my 2337 bookmarks. As mentioned previously, bookmarks can be set as private or public. The setting is per item so it’s easy to grant public access to all of your less sensitive bookmarks but completely hide anything of a more sensitive nature. In addition to full support for tags, there are two hard-wired tags that come as an option on every bookmark. Any bookmark can be set as a favorite by clicking a star next to it. This mechanism provides a quick way to find your favorite reference sources without remembering a tag. Additionally, a link can be set as “Unread.” This has the effect of not only applying the Unread tag but adding a subtle highlight to the link in the list. In this way, Pinboard can be used as a quick reading list, similar to Instapaper. I still prefer Instapaper, but this is a nice option to have. Organize mode has an optional preview window. This is great for curating and tagging a load of bookmarks. In fact, in the Organize mode, going to the next bookmark automatically saves changes. It’s like a rapid-fire bookmark curating system. The preview frame (which doesn’t work with sites that block frames, like StackExchange) is fantastic. How many times have you forgotten what the link was for and need to go to the extra hassle of opening a new tab to view the bookmark before tagging it? Well, enough that I wouldn’t want to tag without the feature. I can’t think of a single reason I would want to go back to maintaining my bookmarks in my browser. Pinboard satisfies every use case I have and even a couple I didn’t know I had. Here are my bookmarks for this post.